ATTENTION IN THE PERIOD FROM 30.12.15 TO 03.01.16 MINIMUM BOOKING LINE 2 DAYS !!! Modern two-bedroom apartments are located near the main street of the city of Melitopol. The bright, spacious apartments create a pleasant homely atmosphere. The guests have everything you need for a comfortable stay. The apartments have a private bathroom with a Jacuzzi, a split system, new appliances and all the necessary furniture. Guests can enjoy free access to Wi-Fi, as well as prepare meals in the fully equipped kitchen. Nearby there is a 24-hour guarded parking lot, supermarkets and many shops. The distance to the bus station is 1.2 km, the railway station is 1.5 km. 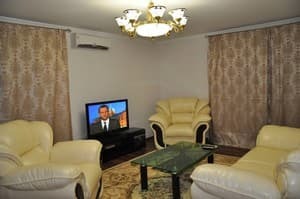 Description of the room: The elite two-room apartments are equipped with a double bed and a sofa, as well as all necessary furniture and appliances. The apartments are fully equipped with kitchen for cooking. Approximately 7 minutes walk from the railway and bus station.